Happy Birthday, man! I wish goold luck and all the best! Gracias chicos. ¡Son los mejores! Thanks guys, they are the best!!! ¡¡¡Bro!!! ¡Que milagrazo que te dejas ver! No te pierdas tanto tiempo men. Feliz cumpleaños (un poco tarde, lo sé LOL) mi querido amigo. Que dios te bendiga. 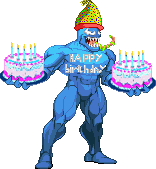 Happy birthday to one of my longest friends ever since my mugen interview days with favorite fiction. He was one of my first interviewees and we discussed Hawkman. He was already a popular creator, but since that time, he became a legend. Hope your day is a good one!